Holy Lord. The windows are stunning! Love, love, love the sink! I love it that Nancy has found a way to keep on collecting! She's got piles of blue and white stacked under the buffet! Really wonderful. I am just grinning from ear to ear with excitement over these images! I am a french girl. Nancy is clearly an english girl, but infuses french into her home so beautifully... like cream... smooth as silk. Tasteful collections displayed with a richness you can feel right when you walk in the door. Lovingly planned out and exquisitely executed... an absolutely perfect setting for a meeting to discuss the upcoming Lauritzen Gardens Antique Show! 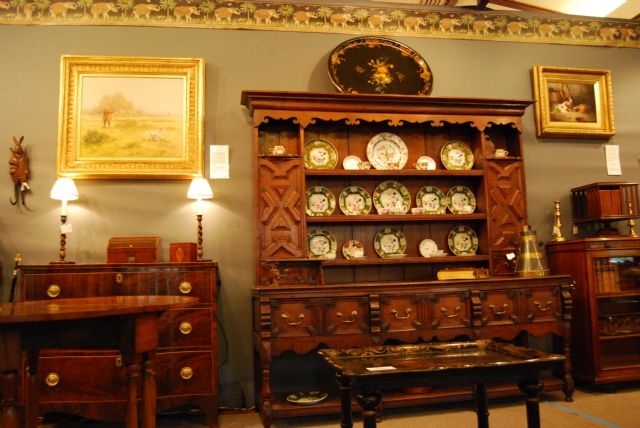 Each year, there are multiple activities and attractions (in addition to the antique dealers) including a Friday Luncheon and a Saturday Brunch with renowned speakers. Past speakers include Bunny Williams, Charles Faudree, Barry Dixon, Jay Strongwater, Carleton Varney and Alexa Hampton... an impressive list by anyone's standards. In keeping with this tradition, the speakers this year, Charlotte Moss and Suzanne Rheinstein will fit right in on the Superstar List! I know! I am so excited! So, if you are in Omaha, or anywhere in the Midwest, or anywhere in the world, you may want to consider a trip to Omaha, Nebraska for a weekend in September. September 23-25 to be exact. 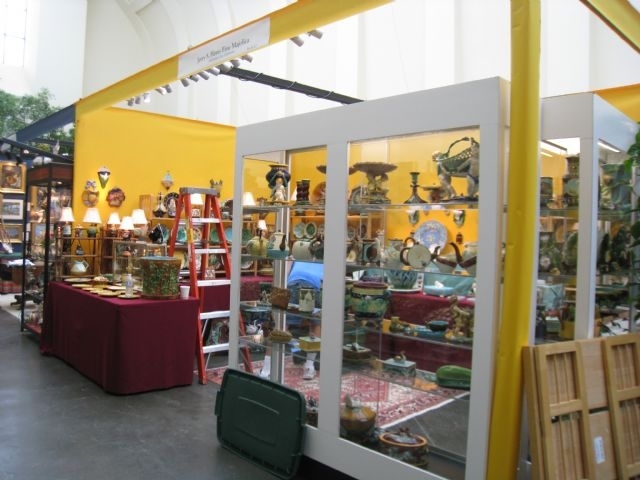 Click on the photo link below to get all the details including information on the dealers, the speakers, educational programs, etc. 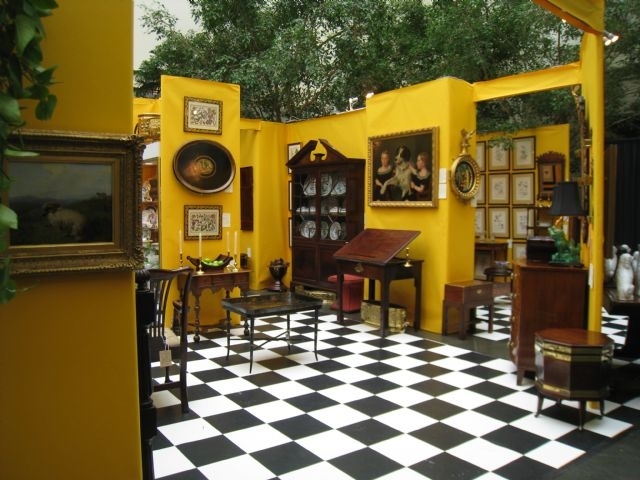 What a beautiful home and so many wonderful treasures and collections. I for one am so glad I got a chance to take this tour. Thanks for sharing. Please drop by my blog this week for my 100th post free give away. Thanks, Richard at My Old Historic House. Holy smokaroo! You weren't kidding!! What a feast for the senses...just so beautiful and so much to see. I will surely bookmark this to go back to and study each room. My faves...of course the blue and white dining room....GOREGOUS! The charming powder room with what looks like a tartan plaid skirt and that devine blue and white sink! All the rich woods and her obvious glorious eye for all things beautiful made this a super treat!! Thank you for sharing to both of you! I'm mad for plaid and happy to see Nancy's tartan collection!!! You can tell she has an amazing eye!! What fun to peek inside her beautiful home!! I am mad for plaid, too! I think the powder room is stunning (the whole house is...but I covet that powder room)! Thanks so much for sharing your photos with us. What a fantastic tour! So, so impressed with your blog and especially with the fabulous pictures of Nancy's home and her stunning collections! 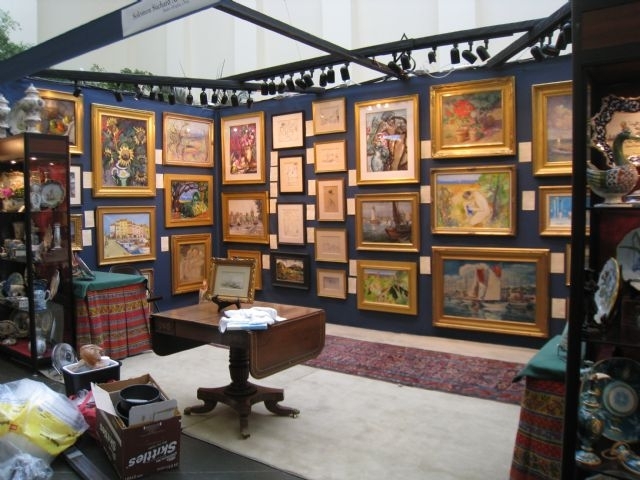 Thank you for telling the world about the Lauritzen Gardens Antique and Garden Show! It is truly one of the best in country!!! Anyone who makes the trip to Omaha in September will not be disappointed!!!! Plus....September is an absolutely beautiful time of year in Omaha! Blue china has always been a favorite of mine. In fact, when I was married 31 years ago my china pattern was a blue and white one. Those treasure boxes I love. It reminds me of one that my mom had, and when she passed away it was handed down to me. Have a lovely weekend. What a gorgeous home and collections. As a transferware collector I was thrilled to see her collection and beautiful displays...especially her sink.